The International Featured Standard (IFS) is the set of rules governing special requirements by the largest international wholesalers and retailers for their suppliers in the food industry. Rhein S.Q.M. 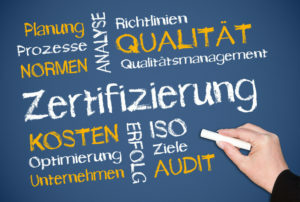 can look back on many years of experience in the food industry and food logistics sector, and can offer comprehensive support services for certification processes, incl. a QM manual, HACCP concept, process and work instructions, forms, product and process monitoring, development processes, and the implementation of all relevant audits (HACCP, recall testing, IFS, and more) plus coordination with the accredited certification bodies. We guarantee the smooth and successful implementation of all your certification projects. You will be able to cater conform with the strictest requirements set out by wholesalers and retailers in terms of process documentation, HACCP risk management, complaints management, deployment requirements, as well as comprehensive QM documentation and technical equipment of your food production facilities. Our team with many years of experience in the food industry will assist you in terms of expert knowhow and methodology. We will get you ready to serve any potential large customer.